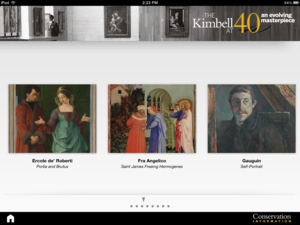 I recently teamed up with Level Ten to create an iPad app for the Kimbell Art Museum in Fort Worth, Texas. 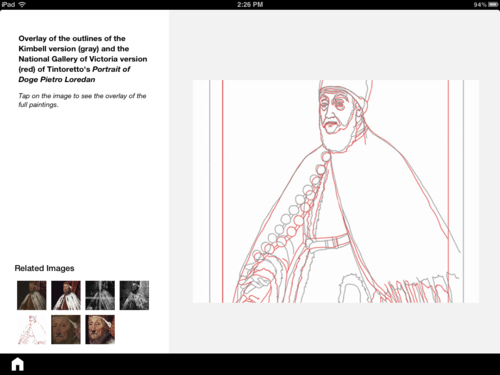 The Kimbell is one of my favorite art museums, so I’m pretty excited about this app! You’ll have to go to the museum to check out the app, because it’s installed on their iPads. From a techie perspective, the app connects to a Drupal server and downloads all of its content locally, so it can be used in the museum in areas without wifi. Also, some of the images are very large – the focus is on art conservation, so you can see before and after images of many of the exhibit pieces. It’s a 100% native Objective-C app, which meant that I was able to develop it very quickly.